The Apple iPhone user experience is pretty snappy. Web browsing, picture taking, trivia-disagreement solving — it all happens at the speed of a tap. Unless, that is, you try to edit and export a video. That’s because speedy video editing is a very hard problem to solve. One of the first app makers to take a serious whack is Flixlab, with its app offering of the same name. Flixlab was started three years and a few patents ago, in the hopes of “letting people do something with the videos they shoot on their devices,” said CEO David Slater. 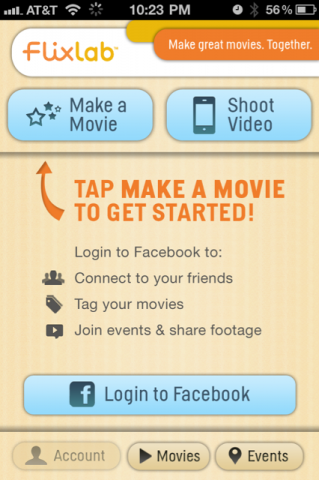 The company markets the app as a social video creation tool. In this case, that means enabling users to create videos, share them on Facebook and then remix other videos that their friends have made through Flixlab. So, basically, it’s a less creepy video version of what has been attempted by beleaguered and overfunded app-maker Color. In addition, there are lots of big players trying to optimize video for social sharing, such as Google and Facebook. Saving time for users is what Flixlab is touting as its real differentiating feature, which is important for video editing on mobile. After editing a movie on Apple’s own iMovie for the iPhone app, the user chooses an export size, which is when the heavy processing begins. Just like professional editing software, the iMovie app chews through the video frame by frame and creates the finished product at the selected resolution. It is analogous to the process an animator would have gone through back in the days of Bugs Bunny, drawing the cartoon one frame at a time. This process, called “rendering” by video nerds, gobbles memory and battery and is probably the most intensive thing an iPhone is asked to do in a normal operation. Even on Apple’s iMovie app, it can take up to two minutes of rendering and exporting time for every minute of video created — a lot more if the video is being uploaded. And those two minutes must be spent with iMovie running in the foreground, so that calling, texting and cat-video watching has to be put on hold. In the iPhone user experience universe, minutes might as well be millennia. Flixlab solves the problem by doing all the video processing in its cloud. This is essentially the same value proposition that cloud gaming start-up OnLive offers: Do stuff on your mobile device at speeds typically reached only by beefy, graphics-enhanced desktop computers. Cloud-based mobile solutions are harder than just making an app, and Flixlab does have an edge solving the most expensive part of it. But the company’s bigger bet is on whether or not users want to co-create video, as well as share. Color bet on the same idea and the jury is still out there. So, if Flixlab can’t make it work either, the tech community may need a new working theory about what “the future of social media” means.